In this review we feature the best powered PA systems for music concerts and performances that deliver crystal clear sound performance. These powered PA speakers have plenty of wattage and can deliver a tonne of volume for large gatherings and events with superb sound quality. Furthermore, some of these PA speakers feature built-in amplifiers, so you don’t have to get extra amplifiers to set up these speakers. Our experts have tested these PA speakers to determine which ones provide the best sound quality and value for money. They also come with XLR inputs for you to connect your microphone to these speakers. If you are looking for powered PA speakers for large events, be sure to check out our top picks below! The Rockville RPG8 is one of the best powered PA speakers you can find that delivers a whopping 400 watts of peak power and 100 watts RMS of sound. This PA speaker comes equipped with a high power long-throw 8” woofer with 2” aluminium voice coil which provides incredibly deep bass and acoustic power. The speaker has a frequency response of 50 Hz to 20 kHz and a maximum SPL of 119 dB peak (116 dB continuous). It’s a great speaker to have for events and concerts where you need maximum sound output without any distortion. We liked the compact and lightweight system which delivers distortion-free sound at extreme SPL. It comes with a built-in linear Class AB amplifier which provides great sound quality at high volume levels. The amplifier provides high power with transparent sonic performance using an internal switch-mode power supply with superior transient response. We also liked the fact the RPG8 speaker has a built-in bass and treble equalization processor for system control. It features a 1.35” Japanese titanium-diaphragm compression driver for cystal clear high-frequency reproduction. The speaker is built for ultra-wide sound dispersion, with 40 degree large-format horizontal wave guide horn molded directly into the cabinet. This PA speaker also has a low-noise mic line input via XLR and ¼ inch stereo jacks with volume control. It also features additional balanced line output via XLR for linking of additional speaker systems. The speaker is flyable and stand mountable with 35mm pole sockets. Finally, the entire speaker is made from high-quality components with rugged high impact ABS construction. It comes with an amplifier clip and LED indicator and LED cabinet rear with a front display power meter. 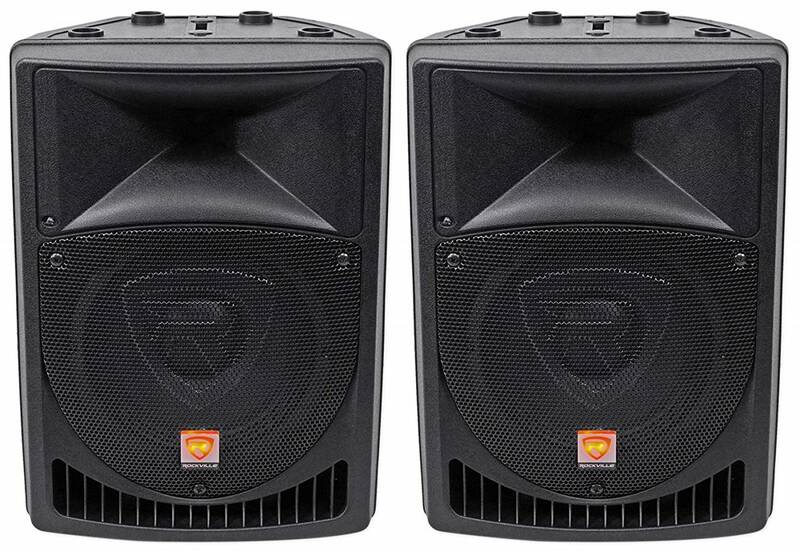 Overall, the Rockville RPG8 is a highly efficient powered PA speaker with massive 400 watt sound output and we highly recommend them. 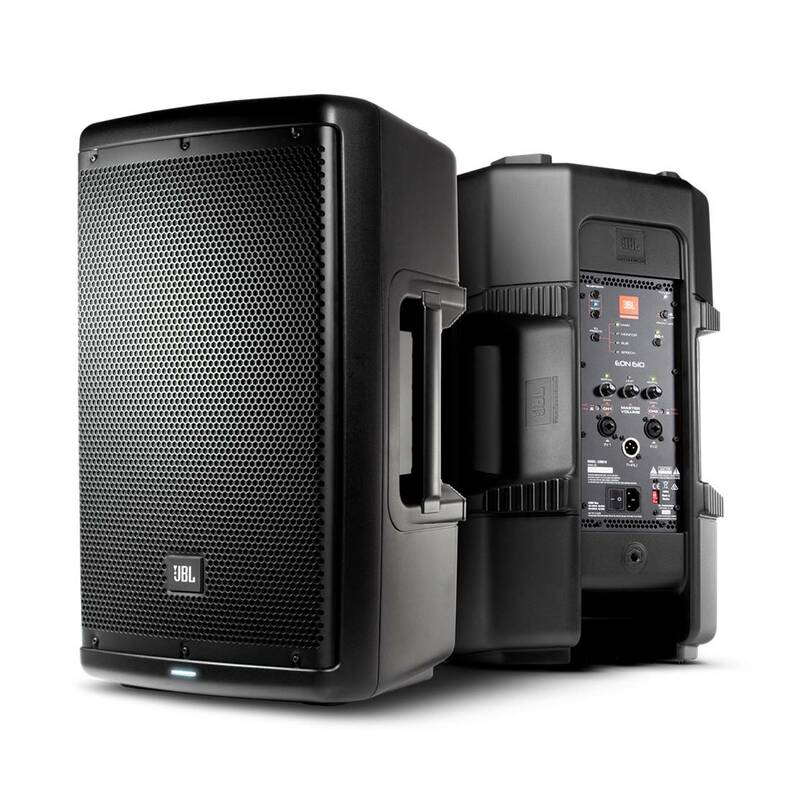 The Behringer Eurolive B210D is one of the best powered PA speakers we have tested that delivers up to 200 watts of sound reinforcement. It is ideal for live concerts and playback applications with loud volume output. The entire speaker has a pretty solid built and the sound is loud and clear – at the back of the speaker are knobs to adjust the bass, treble and volume ranges. The entire speaker sounds great as a standalone speaker with good bass response and crisp details. You can also connect a microphone using an RCA to XLR adapter on this PA speaker. The B210D speaker is ultra-compact and lightweight, delivering distortion-free sound at loud volume levels and extreme sound pressure levels. It comes equipped with a Class-D amplifier that provides a lot of power for sonic performance and sound amplification. It has an internal switch-mode power supply for noise free-audio, and superior transient response with very low power consumption. It also supports integrated sound processing for system control and speaker protection. We liked the fact that we were able to crank up the volume on the B210D very loud without hearing any distortion on the speaker. The treble and vocal ranges were crisp and clean, and the PA speaker connects to microphones for easy sound amplification. The great thing about the B210D is that it is a portable speaker and can be easily setup for DJ events or gatherings. 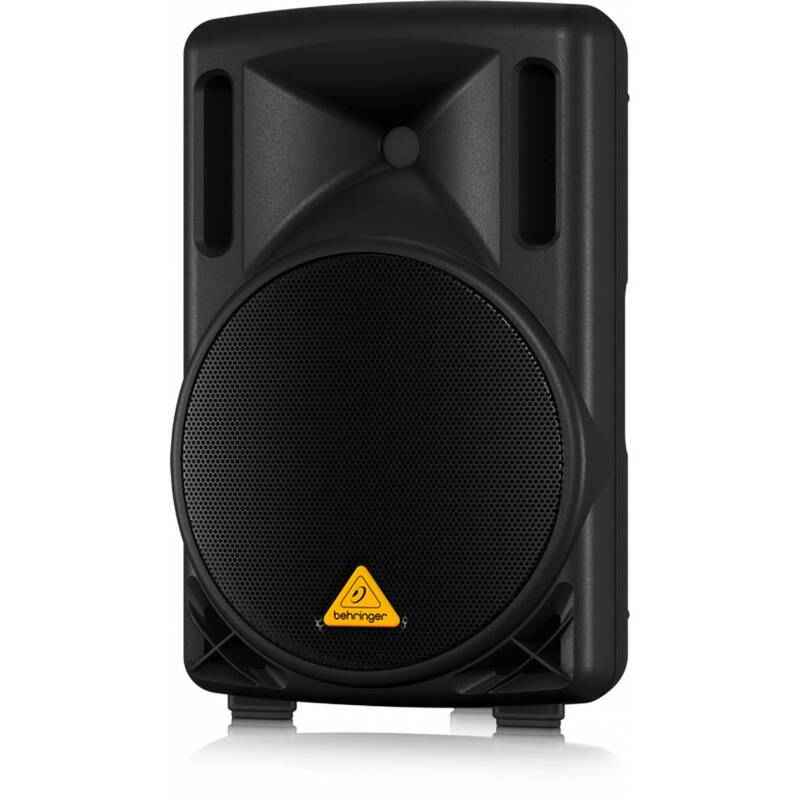 Overall, the Behringer Eurolive B210D is one of the best powered PA speakers available that delivers superb audio quality and we highly recommend them. The Yamaha DBR10 is one of the best powered PA speakers we have tested that delivers a whopping 700 watts of full-range sound output. It is a Bi-amped speaker with 10” acoustic drivers that provide full-range sound. The Yamaha speaker uses the latest DSP technology with proprietary FIR-X tuning to optimize the sound output and provide maximum volume output without any distortion. The entire speaker is bi-amped, using a separate power amplifier for the woofer and the high frequency driver to deliver accurate and controlled sound output. The DBR10 is one of the few powered PA speakers to deliver a maximum of 700 watts of clean audio power with 129 dB SPL. All the acoustic components in this speaker are designed to perform with the power amplifier and DSP, providing a natural sound signature at high volume levels. The DBR control can be easily configured for use as a high performance floor monitor or great sounding main speaker setup. The speaker also has bass and treble knobs on the speaker which you can adjust the sound performance according to your preferences. The sound quality of the DBR10 is solid and crystal clear – the bass feels smooth and well defined without any bloated or muddiness. The highs on music performances go all the way up without feeling harsh or distorted – the midranges are crisp and well-defined, with detailed vocal reproduction. It’s a powered PA speaker that’s perfect for events and gatherings where you need extra audio reinforcement with loud sound output. The LyxPro SPA-8 is one of the best powered PA speakers that comes in a sleek and compact design. The speaker is capable of pumping up to 100 watts of power and weighs a mere 14 pounds. It has a dimension of just 14” x 9.25” x 8” and is highly portable, making it an ideal option for small concerts and events. The speaker comes equipped with an 8” woofer with 70 watt LF and 30 watt HF. The sound performance of the SPA-8 PA speaker is crystal clear, with crisp highs, detailed midranges and good bass performance. You can adjust the volume on this speaker to maximum and it will not distort – the sound remains consistent and crystal clear. The SPA-8 speaker features a tonne of input options including a ¼” jack with mic selector switch, XLR jack, balanced RCA jack, and R/L RCA line inputs. The XLR line also allows you to daisy chain to another active speaker to create a much wider soundstage. The SPA-8 PA speaker comes with on-board EQ settings that adjust the sound to your preferences. The treble knob controls the tone level of the high frequencies, and the bass knob allows you to increase the bass response on this speaker. We also liked the fact that this speaker supports Bluetooth, USB and comes with an SD card slot that allows for seamless playback for your music. The LyxPro SPA-8 has a frequency response of 40 Hz to 19 kHz and a maximum sound pressure of 106 dB with a nominal sensitivity of 91 dB. It comes with a high-frequency 1” titanium driver that provides crisp highs and clean vocals for music concerts and events. Overall, this powered PA speaker is a great choice with a portable and compact design and we highly recommend them. The Alto Trouper speaker system is a compact high-performance powered PA speaker with 3-channel mixer for small venue performances and concert events. The Trouper speaker is designed with a built-in mixer and all of the inputs you need including Bluetooth capability for wireless audio streaming. 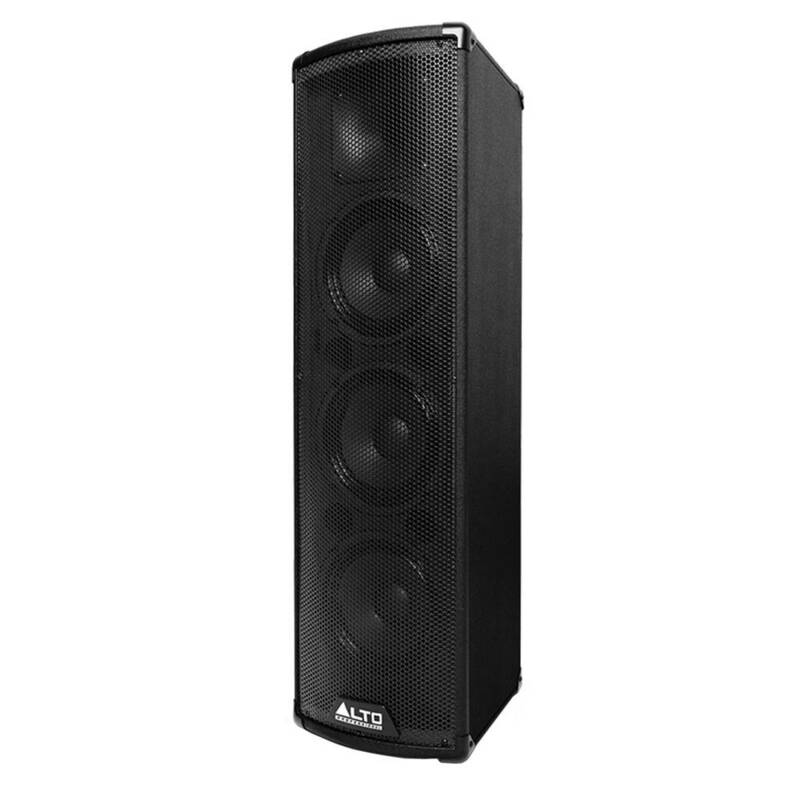 The Alto Trouper speaker has a trapezoidal shape which reduces internal standing waves and resonances, resulting in cleaner output in upper bass and vocal ranges. It also has 2-band built-in EQ settings for each channel. The mixer also offers XLR, RCA, ¼ inch and 1/8 inch connectors to accommodate a variety of input sources. This speaker consists of a two-way 200 watt bi-amplified system with three 6.5” woofers and 1” high frequency driver for crystal clear highs and deep bass reproduction. The speaker supports A2DP streaming audio with full stereo link when using 2 Trouper loudspeakers together. It also comes with an XLR link output for use with additional loudspeakers and subwoofers. We liked the sound performance on the Alto Pro Trouper speaker – the sound quality is full-range and it has deep bass performance that feels tight and punchy. The speaker does produce a good amount of volume output without any distortion. This PA speaker comes with built-in rear handles which makes it easy to take around and setup on speaker stands. 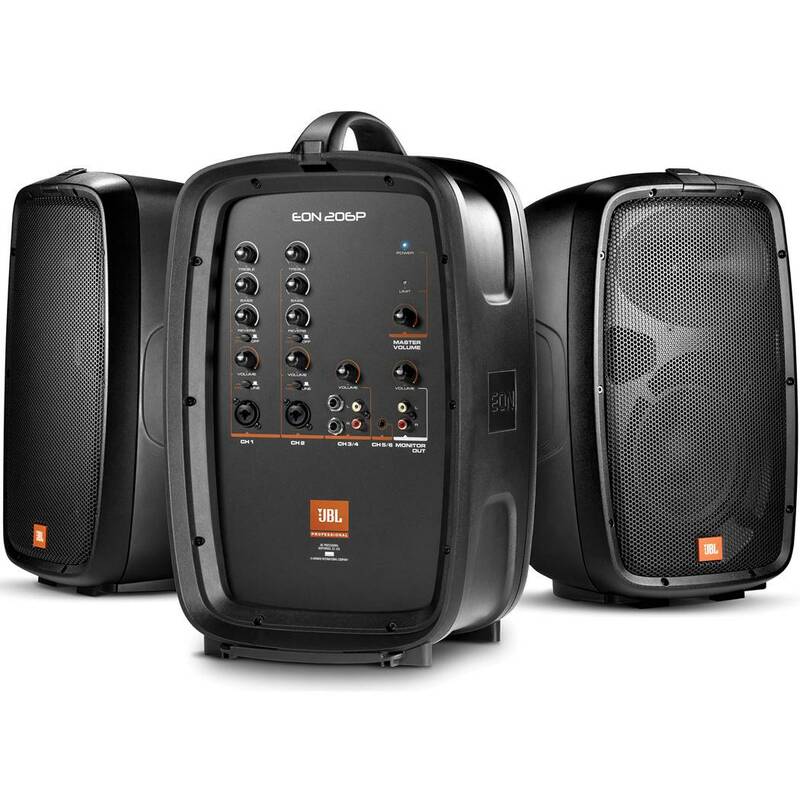 The JBL EON206P are among the best powered PA speakers that includes a 2-way PA system with 6-channel mixer. These PA speakers are portable and easy to use, and come with a powered mixer input panel with multiple input channels with tone controls. This allows you to integrate the PA system into audio environments for amplification and mixing with electronic musical instruments. The EON206P PA speakers come with a lightweight and ergonomic design together with a soft touch grip at the top for easy handling. The speaker comes with a built-in 6-channel powered mixer together with two powered 6.5” woofers and 4 stereo inputs. We also liked the fact that these speakers come with large volume control knobs for easy usage and high visibility under dim lighting. The mixer stands vertically for easy access and pairing. In terms of sound quality, the JBL PA speakers have a slightly warmer sound signature with deep bass and low-end frequency response. The highs and midranges are well-defined, and we thoroughly enjoyed listening to these speakers with crystal clear vocal performances. You can practically crank up the volume on these JBL PA speakers and expect to hear very little distortion. The amplification on these speakers is great and the mixer panel at the back of the speaker provides a degree of flexibility in terms of sound performance. The EON206P speaker features various inputs including x2 XLR, balanced TRS inputs, RCA jacks, 3.5mm jacks and RCA output jacks. 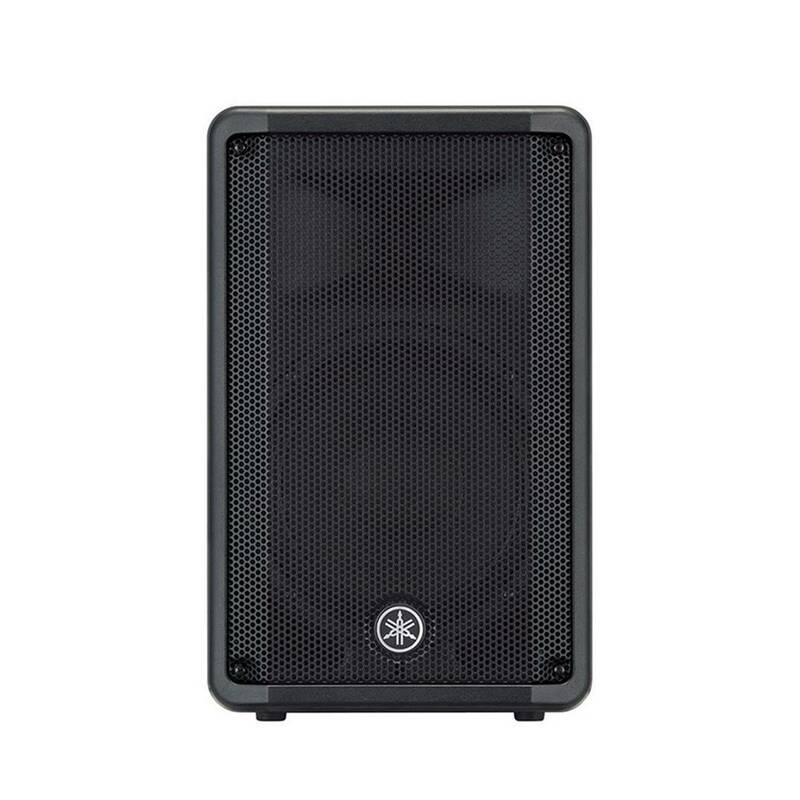 The Pyle PPHP103MU is one of the best powered PA systems with full wireless functionality and a max power output of 800 watts. This PA system is equipped with a heavy duty self-powered 10” subwoofer for deeper bass response. The entire speaker can reproduce full-range sound performance with crystal clear highs, clear midranges and deep bass response for robust sound performance. The speaker features a 10” woofer and 1” tweeter for 2-way full range audio projection. The Pyle PA system is compatible with any media and can connect to your audio device via RCA input line-in. It also supports wireless Bluetooth streaming and can play music directly from your smartphone device. The speaker also supports USB flash and SD memory card with mp3 file formats. We liked the fact that you can chain link multiple Pyle speakers together using an XLR cable from one monitor’s line out port to the next loudspeaker’s line to play mono or stereo amp music. The XLR input makes it easy to connect to a mixer or use the port to add a microphone or instrument directly. The Pyle PPHP103MU comes with a top handle that makes it easy for transport on the stage or mountable on speaker stands – it has a built-in port which allows you to set up the compact DJ speaker sound system on a standard mount. The speaker also comes with a high, mid and bass frequency knobs for you to adjust the sound output depending on your preferences. The entire speaker has a durable construction with heavy-duty ABS housing with digital LCD display screen. The PA speakers come with remote control and power cables for easy setup. The Rockville RPG15 is one of the best powered PA speakers with a full 1000 watts of power and 250 watts RMS. These speakers come with a high power long-throw 15” woofer with 3” aluminium voice coil which provides deep bass and acoustic power. The RPG15 PA speaker has a frequency response between 35 Hz to 20 kHz with a maximum SPL of 128 dB peak. 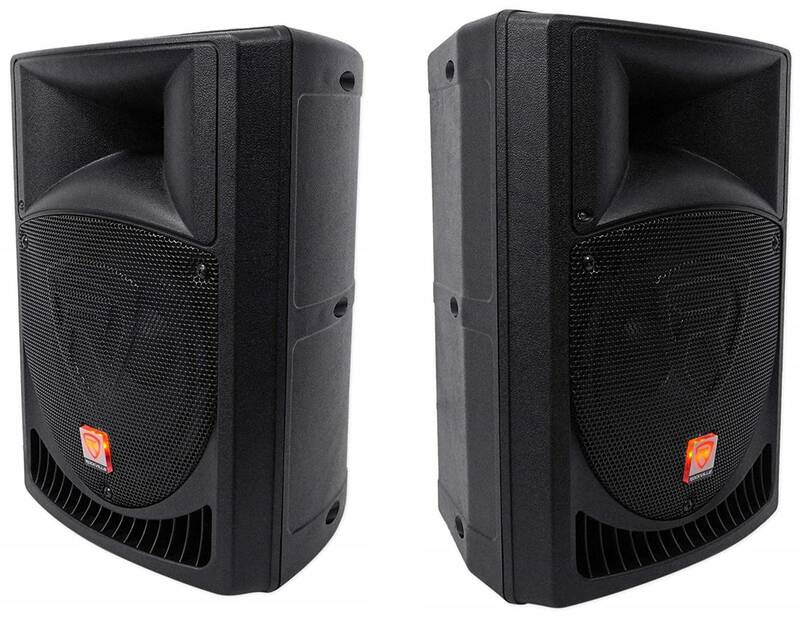 The RPG15 is a high-powered 2-way sound reinforcement speaker system for live music concerts and performances. It features linear Class AB amplifier technology which provides high power and transparent sonic performance. The 15” woofer built into this speaker has a 3” aluminium voice coil which provides extremely loud and deep punchy bass response. It also has a 1.35” Japanese made pure titanium diaphragm compression driver which has ultra-wide dispersion with 40 degree large-format horizontal wave guide horn for full-range sound dispersion. We liked the fact that this PA speaker comes with low-noise microphone inputs via XLR and has ¼ inch stereo jacks with volume control. It features line RCA and XLR input with separate gain adjustment. You can also chain link multiple speakers via XLR for linking with additional speaker systems. 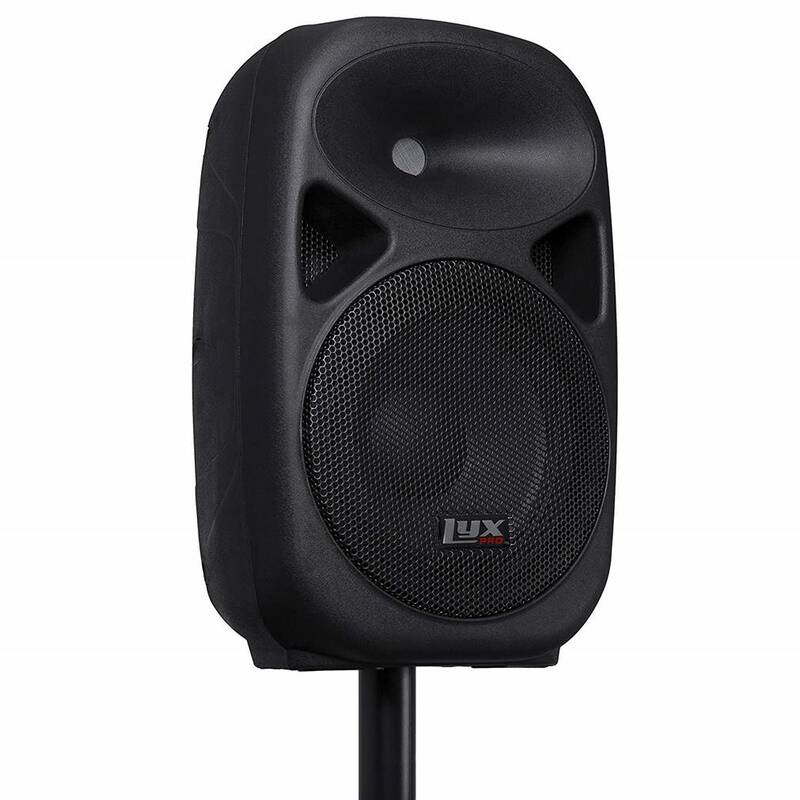 The entire speaker has a versatile trapezoidal enclosure design that allows different positioning – it is flyable and stand mountable with 35mm pole sockets. This powered PA speaker system is made from high-quality components and rugged high impact ABS construction. It has a front display power meter with 110 / 220 volt switchable power supply with external user serviceable fusing. The JBL EON610 is one of the best powered PA speakers that feature JBL waveguide technology and Bluetooth integration with durable nylon coil zippers. This PA speaker comes with a 10” woofer with bass reflex cabinet for deeper sound reproduction, and proprietary waveguide technology for added sound dispersion. The EON610 comes with a 1000W peak class D amplifier with Bluetooth controllable DSP. We liked the fact that this speaker supports 5-way user definable parametric EQ settings for you to adjust the sound output according to your preferences. The JBL EON610 features an ergonomic and portable design that provides better acoustic sound performance. It comes with two well-positioned handles at the top which make it easy to carry and move around. The speaker also has integrated hardware mounts designed into the enclosures which allow for in-flight transport. The speaker also has index feet molded into the enclosure which allows for secure stacking on stage monitor and speaker stands. In terms of sound performance, the JBL EON610 delivers crystal clear and very loud sound performance with plenty of power. 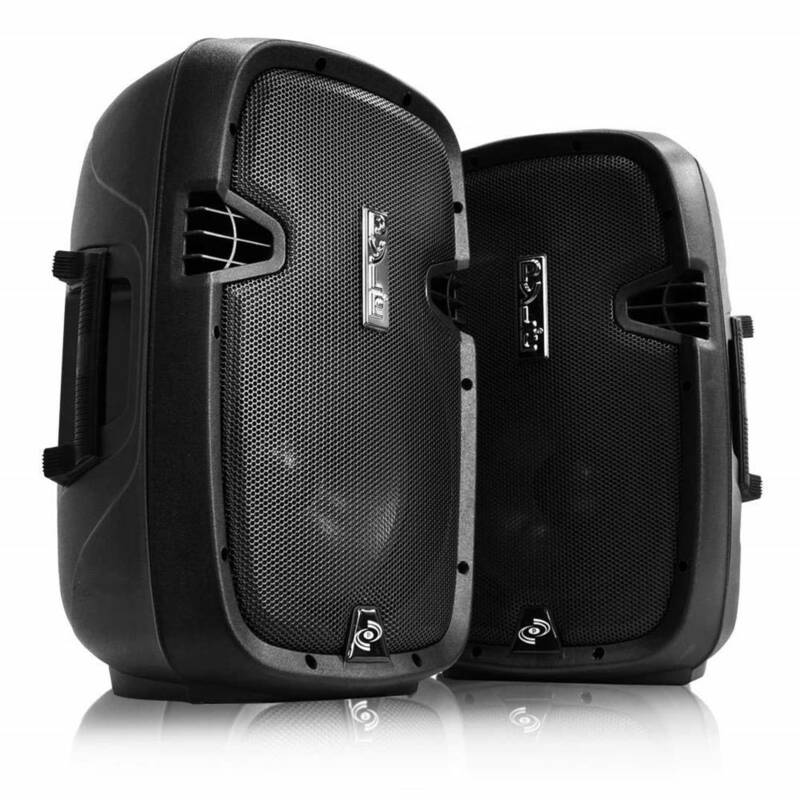 They are great for large concert and events where you can blast music to your audience. The highs and midranges on this speaker are crisp and clear, while the bass feels tight and punchy without any distortion. The EON610 PA speaker provides smooth and transparent sound that feels full-range and well-defined. If you are looking for a powered PA speaker that can live up to expectations, we highly recommend the JBL EON610 speakers. 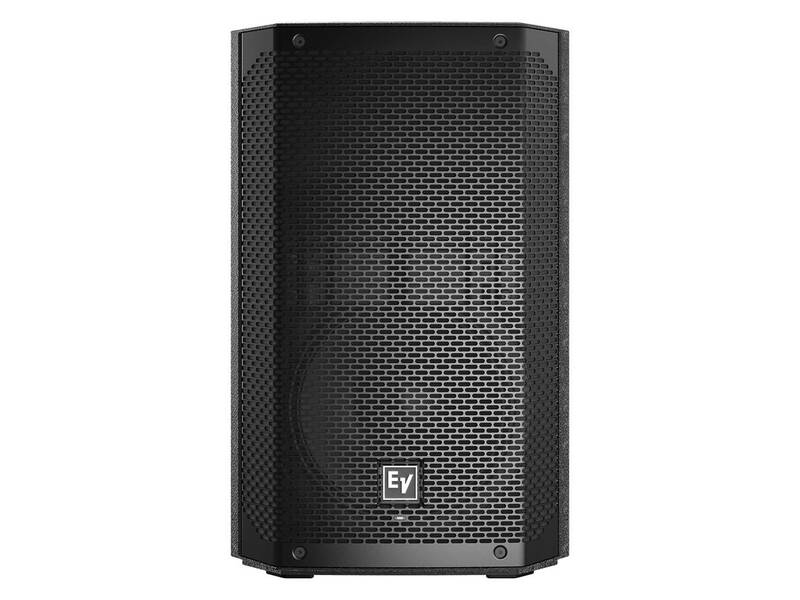 The Electro Voice ELX200 is a powered PA speaker that comes with a high-efficiency 1200 W Class-D amplifier which delivers up to 130 dB peak SPL utilizing transducers designed by EV. The speaker produces thunderous sound performance for concert performances and live events; it also comes with the EV QuickSmart mobile app that allows you to wirelessly configure and control up to six ELX200 PA speakers simultaneously. This powered PA speaker allows you to easily setup four presets (Music, live, speech and club) with system-matched crossovers, three-band EQ and five user-programmable presets to adjust the sound output according to your preferences. It also comes with EV-patented signal synchronized transducers waveguide design which provides precise and consistent sound coverage without any distortion. 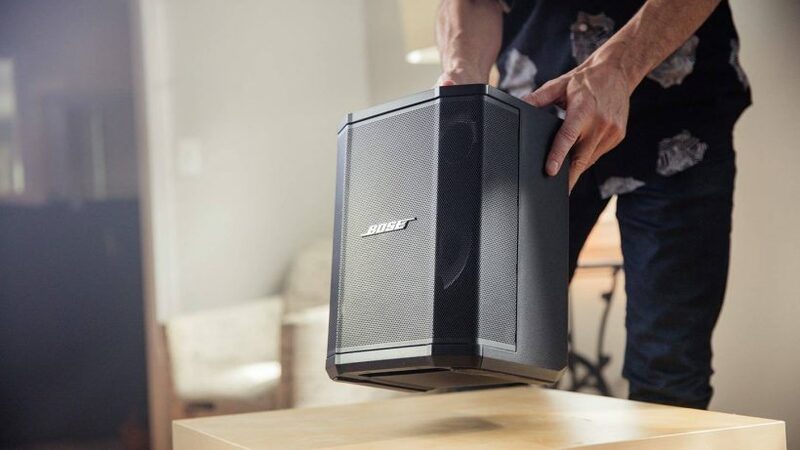 The entire speaker is designed for maximized acoustical loading with full-range sound performance. We were very impressed by the overall sound quality of the ELX200 PA speakers. These speakers can pump out some serious volume that can fill up an entire concert hall at maximum volume. The bass output on these speakers feels tight and punchy and adds plenty of flare to music performances. Rock and pop music genres sounded particularly good with the ELX200 speakers – with deep notes, solid bass and crystal clear vocals. The ELX200 PA speaker is comes with professional hardware – it has three M10 threated moutning points for forged eyebolts, integrated pole-mounts and ZLX two-handle design for easy fitting. Best Sounding Earbuds 2019: Which earbuds sound the best?